Pat Houlihan also sings lead vocals, plays rhythm guitar and another one of those weird instruments the band is known for, the jaw harp. Unbelievably, Pat still has all of his own teeth! If you’ve not seen a jaw harp played to the tempo of “Cripple Creek,” you are in for a treat! When he’s not performing as a “Melonhead,” he teaches writing at Central New Mexico Community College (CNM). He has been playing music for most of his life and is the composer of the band’s original songs, including three songs on the band’s latest recording Radio Station WMJB . So you thought it was a washtub to hold water or fish maybe? Well, look again! Gary “Gut Bucket” Oleson plays the washtub (or gutbucket) with reckless abandon. Wanna know how he finds a washtub with the right tone? Well, he goes to the local hardware store and turns each tub over and thumps on the base with his hand. A strange sight? Yup, but it works! Gary retired from Los Lunas Public Schools as a math teacher and then became the band’s first grandparent. The jug band family lives on! In his off-stage life, Gary does a lot of BMW motorcycle riding. Ben Perea, 5-time New Mexico state banjo champion (until he was told he had to start being a judge! ), is a musician extraordinaire. Whether he’s playing banjo or guitar, Ben never misses a beat (and rarely a note!). He started playing banjo at 16 and joined the band before he was old enough to be in establishments requiring IDs at the front entrance. Luckily, the band came in from the back door! Now the retired band director of Valley High School in Albuquerque, Ben runs the New Mexico Academy of Driving, teaching beginners how to “keep ‘er ‘tween the ditches.” Ben swears he never talks on his cell phone while driving! Born in the banjo mecca of Estancia, NM, he now lives in ABQ. 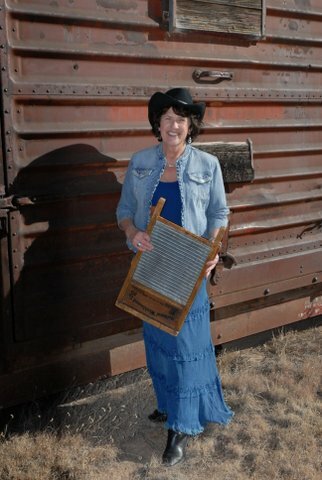 Barbara “Loose Hands” Piper does do laundry, but not on this washboard! With those thimbles on her fingers, she scratches up a rhythm on musical washboard, called a “poor man’s drum set” in the original jug bands of the 1920s. Along with the washboard, she plays high-hat cymbals and other percussion. You might just be one of the lucky audience members who get awarded a kazoo by Barbara during performances for great “audient” behavior! Barbara lives in the Sandia (Watermelon) Mountains east of Albuquerque and is a retired teacher from Albuquerque Public Schools. She teaches college courses for Santa Fe Community College Teacher Academy and does independent educational consulting. If that doesn’t drive a person to play the washboard, nothing will! The Watermelon Mountain Jug Band has been entertaining audiences, young and old, since 1975. True to the original 1920’s jug bands of the South, our music comes alive with washboard, jug, kazoo, washtub bass, spoons, guitar and banjo. 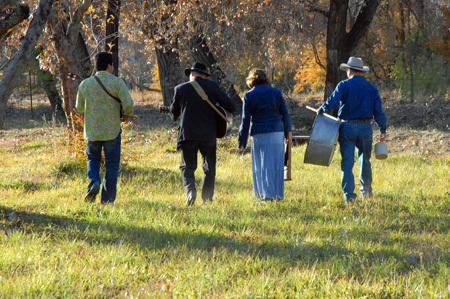 The band delights audiences with jug band, ragtime, country, bluegrass and original music with some classic rock ‘n roll. Ben might even play a classical piece! Performances have included appearances at the KIMO Theater, Rio Grande Zoo, Albuquerque Bio Park, Rio Grande Arts and Crafts Fair, Placitas Artists Series, International Hot Air Balloon Fiesta, Santa Fe Bluegrass Festival, with the New Mexico Symphony Orchestra, and much more! We also play for national and international conferences, weddings, private parties, school and community events. The Watermelon Mountain Jug Band has been recognized as “ one of New Mexico’s treasured natural resources”… “ a truly unique mixture of music, mirth and pure entertainment” …” totally irresistible.” So sing along! Grab a kazoo! And enjoy. It’s just too much fun to miss!